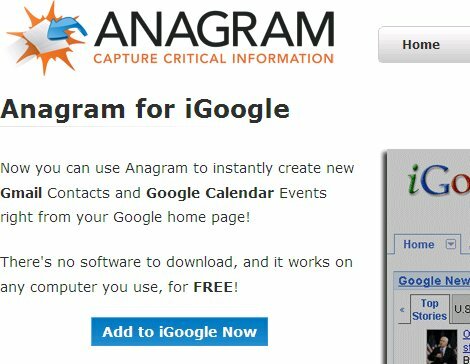 I've been using Anagram on my desktop PC to add contacts to Outlook. With Anagram, you just copy someone's email address, press a magic key combo and it opens up an Outlook contact record with all of the fields filled in. It is almost magic. The problem for me is that Outlook has to be open for me to add the contact. I add them to Outlook, then sync to my Blackberry and eventually to Plaxo. 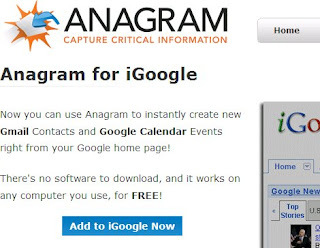 Poking around for solutions that will help me eventually dump Outlook altogether, I discovered that there is an iGoogle gadget for Anagram that will let me grab an email signature and then drop it into my GMail contact list. I tried it and it seems to work just like the software installed on my computer. Sweet! Copy an email signature you'd like to have in your GMail contacts list. Done. Did I mention what a time saver this is?